Back at CES 2018, Tim and I stopped by the Nanoleaf booth to checkout a new remote product they were introducing that would allow you to control your triangular Nanoleaf Light Panels. The Nanoleaf Remote was fun and all with its pentagonal 3D shape and vibrations, but Nanoleaf had an extra surprise up its sleeves at the booth that not only impressed the hell out of us, it stood with us up until launch late last year as a product we needed to own. I’m talking about Nanoleaf Canvas, the touch-equipped smart light panels that I’ve been testing for the better part of the past five months. 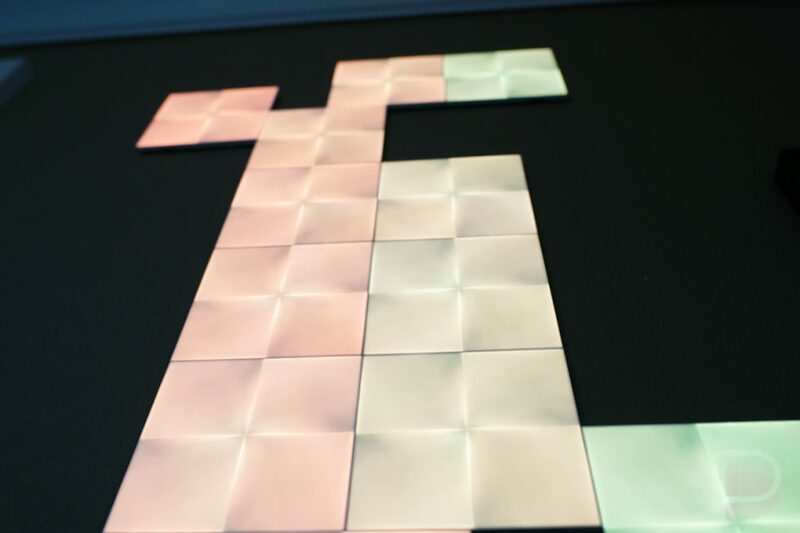 Like Nanoleaf Light Panels, Nanoleaf Canvas is a new set of smart lighting that can be connected and formed into custom designs on your wall. These are square (called “Light Squares”), unlike the original triangular light panels, so they fit together much more cleanly. They have a full range of colors, can react colorfully to music you have playing, and pair with an app to offer you all sorts of additional controls. Nanoleaf Canvas is unique in that the panels are touch-enabled. You can touch them to turn a wall on, swipe your hand across to adjust brightness or switch scenes, or just play with them because a touch-enabled light wall is straight-up cool. Canvas can be voice-controlled using Google Assistant or Amazon Alexa, you can setup controls via IFTTT, or automate their activities using the Nanoleaf app and its scheduling function. 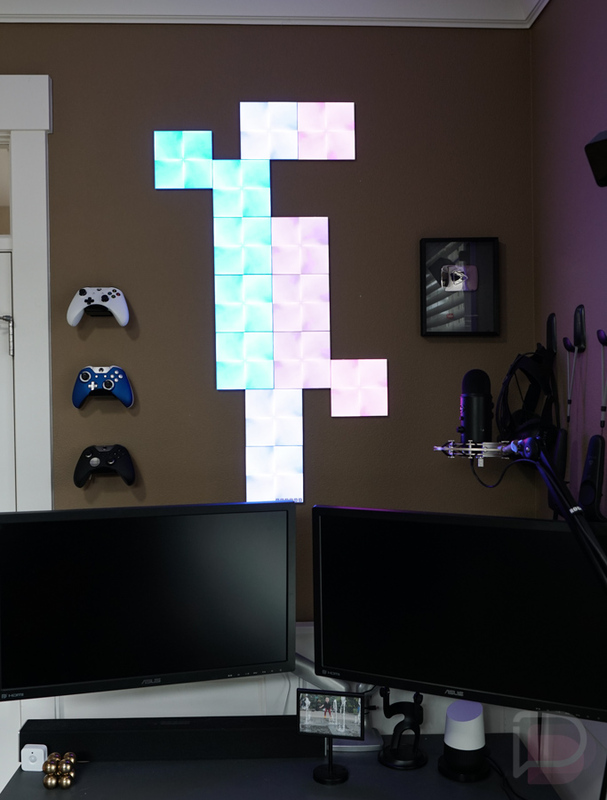 Nanoleaf Canvas starts at $249.99 for a set that includes 9 Light Squares. You can buy packages with 17 or 25 squares at quickly rising prices, or expand any set with expansion packs that cost $79.99 and includes 4 squares. 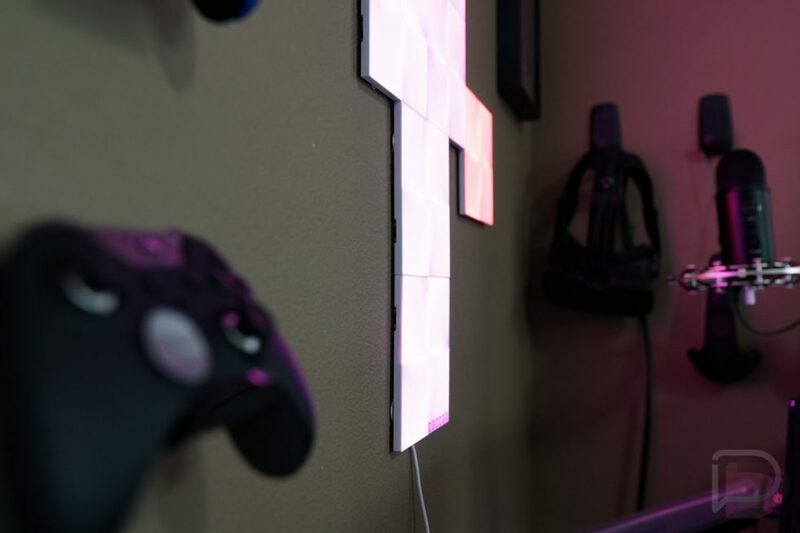 When you aren’t attempting to rub up against your Canvas, the majority of controls (including setup) over your Light Squares happens through the Nanoleaf app. The Nanoleaf app has more controls than you are probably imagining. 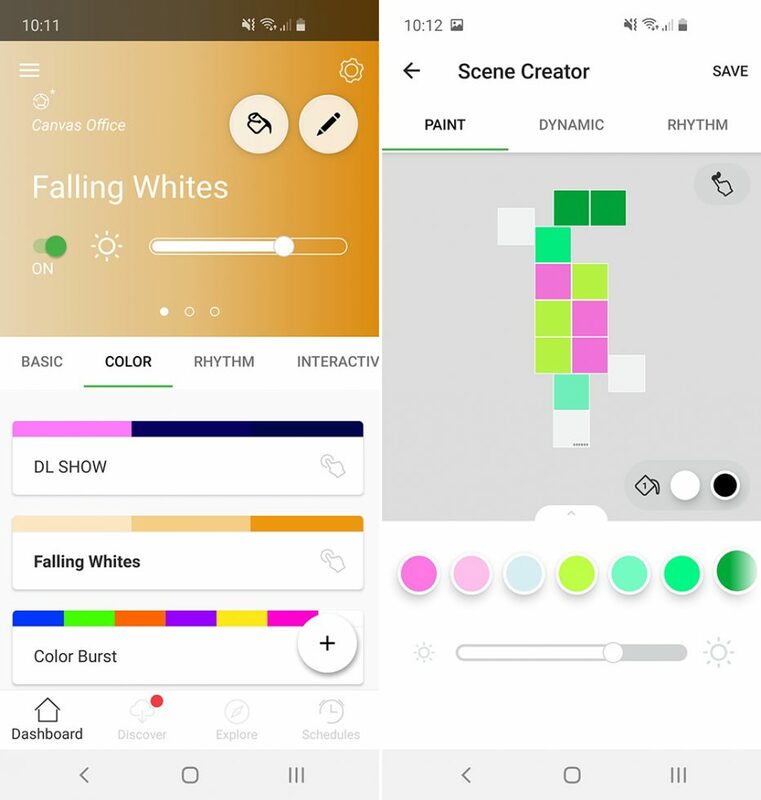 You can setup basic colors, choose dynamic setups that constantly change colors, have color scenes bounce to your music, and go “interactive” to play games like Whack-A-Mole. You can fully customize every single scene type, create your own from scratch or edit pre-loaded scenes, and download new ones. You can adjust brightness, individual squares, pick the number of colors to show in a dynamic setup, choose the loop pattern and speed, adjust fading and so much more. You can even have your Canvas adjust automatically based on ambient light in a room. Seriously, the amount of customization you can do here is next-level. The Google Assistant integration here isn’t bad. 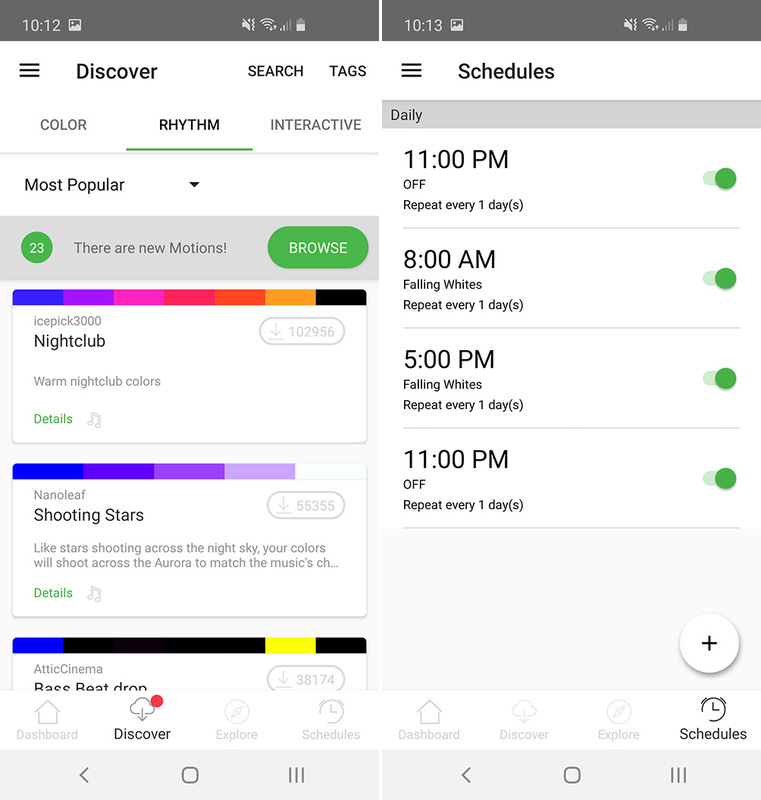 You can setup Canvas to turn on or off by voice, adjust the brightness, and choose colors. Canvas setups also show within the Google Home app, so you can set them to rooms for more general routines and controls. Within the Google Home you can manually turn on or off, adjust brightness, and choose from Home’s color picker. I do wish the Nanoleaf app had built-in widgets to control different rooms or panels or scenes, but there are none. If you want to setup shortcuts, you’ll need to go into IFTTT and get busy that way. For this review, I have to admit that I’m not a huge fan of IFTTT and did not do any of that. Overall, though, the Nanoleaf app experience is pretty solid because of all of the options within the app that really give you control over your lighting. Don’t have the app? You have a limited set of controls on the bottom of a single Light Square. The controls on it allow you to power them off or on, switch scenes or modes, and adjust brightness. But should you buy Nanoleaf Canvas? Overview stuff out of the way, is a set of $250 touch-enabled smart light panels something you should consider buying for your house or apartment or office? Ummm, sure! 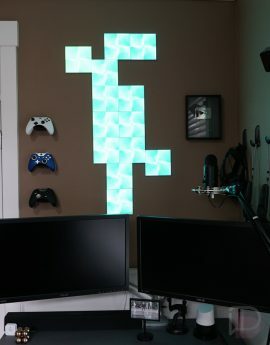 I say that without any conviction because while I do think Nanoleaf Canvas is a really cool product that looks great in my office during DL Shows and is a nice conversation piece the first time people see them in my living room, we’re talking about an interactive light wall concept that eventually just turns into a decoration. That’s not me saying that Canvas isn’t something you should buy. If you have the cash and think your house’s ambiance will be improved by a lit-up wall, go for it! These are cool! 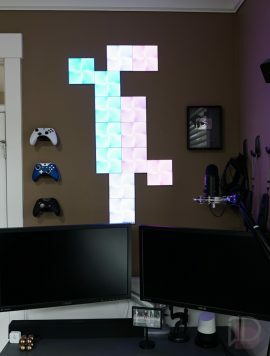 My hesitation around products like Canvas or the original Nanoleaf Light Panels stem from this worry that because they are decorative pieces, you may not care about them for long. Since they aren’t inexpensive, this is where it becomes a difficult decision. As I mentioned in the opening, I’ve had Canvas in my house for five months, so I have had plenty of time to decide if this is a product that has become an essential piece of my at-home life. Right now, I have two different Nanoleaf Canvas setups. I have a set that I purchased and added an expansion kit to in my office, above my gaming setup and in the background of DL Show broadcasts. I turn them on regularly when I’m in here working or destroying homies in Blackout. They look nice. However, I get zero benefit out of the touch feature because they are up on a wall, behind a couple of monitors. Am I getting good use out of the investment? Not the touch part, unfortunately, but again, the lights looks great. 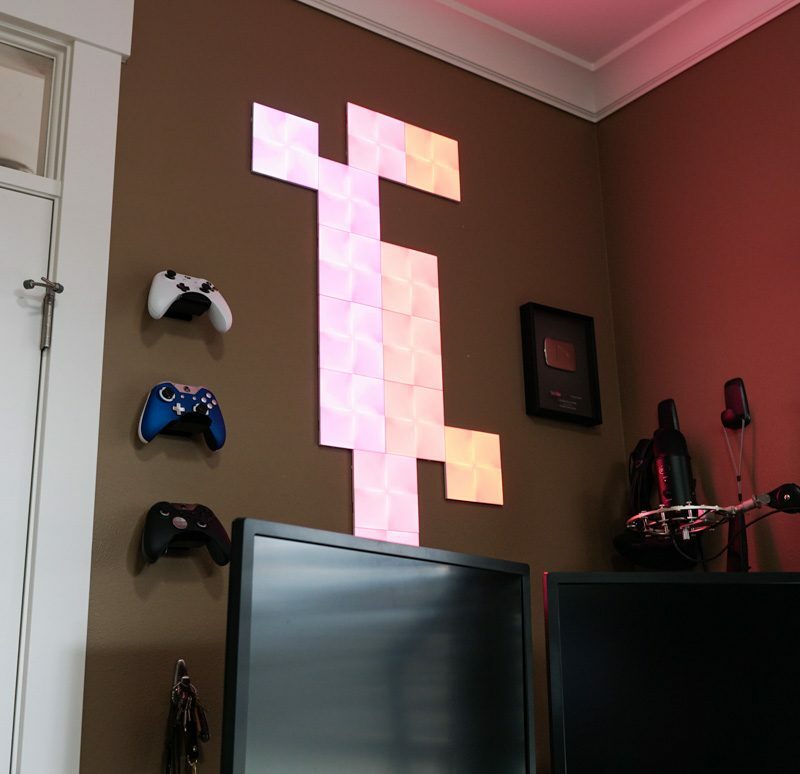 The other set I have is a review unit Nanoleaf sent over that I slapped on a wall in my living room/kitchen area. I put them low enough so that my kid could play with them if he was interested in doing so. I wanted to put some in a place that would get enough traffic to grab people’s attention. Within a day or two, my kid wasn’t interested in them, guests didn’t care after seeing them for the first time, and now they are just a light panel in a spot in my living room. 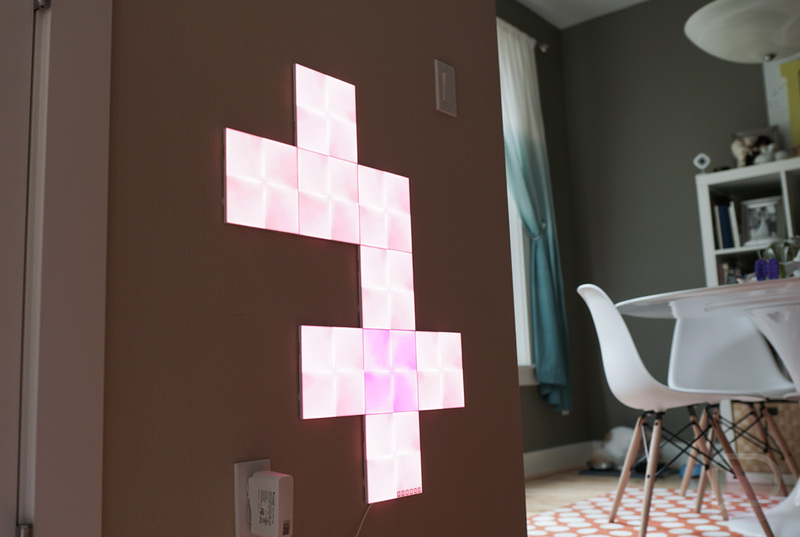 I think my takeaway from life with Nanoleaf Canvas is two-fold, because on one hand, this is probably one of the coolest smart light kits you could put in your home. It’s interactive, you can change the layout or design as you see fit, the number of color sequences and scenes are never-ending, and they’ll certainly add some flavor to any room. On the flip side of that, after five months, Canvas isn’t something I constantly feel the need to interact with or adjust or brag about or use all that often. It’s there, in a couple of places, yet it’s just some light panels that were fun to play with during the first couple of honeymoon days. So yeah, Canvas is very cool and at the same time expensive enough that the value might be somewhat of a tough sell for everyone.